I agree that the idea of having a bat as a pet is cruel. I’m just wondering though, without judging either, would Noah’s intention be for sale as pest control? Mosquitos being such an ever increasing problem and with Zica (sp?) virus – wish that purchases were intended for release in hopes of having bats in area. It’s against the law to buy and sell native insect-eating bats in the US. 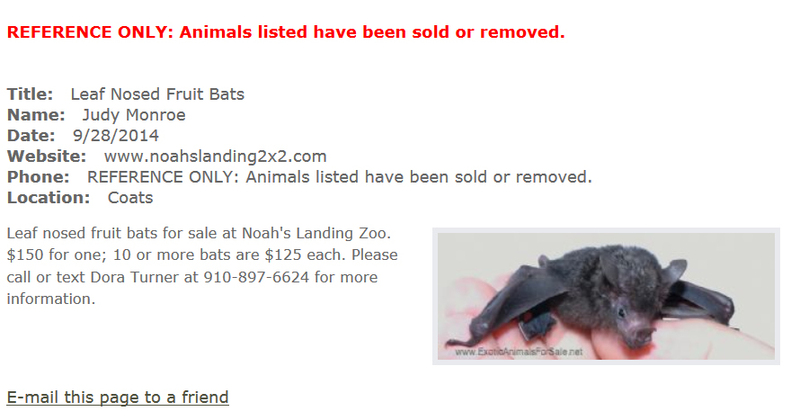 Noah’s Landing sells fruit bats, they are only in it for the money.